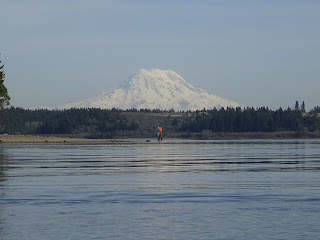 One of my early kayak trips in salt water was in Nisqually Delta. March 28, 2004. We started at Luhr Beach and paddled up McAllister Creek just about to I-5 on the flood. We turned around and paddled back (against the flooding current) and had lunch at Luhr Beach. After lunch, with lots of water in the Delta, we paddled over to Anderson Island (didn't get out, just explored the south end of the island). Tide was ebbing on our return so we needed to be careful not to get stuck on the mudflats.